Our father among the saints Macarius II (Nevsky) of Moscow, also Makary II, was the Metropolitan of Moscow and Kolomna during the final years of the reign of Tsar Nicholas II of Russia. A missionary and enlightener of the people of the Altai region, he is remembered as the Apostle of the Altai. Michael Andreevich was the sixth child of a poor rural family of the sexton Andrew Parvitsky, later Nevsky. Michael was born in 1835 in the Shapkino Kovrov district in Vladimir Province. He was born a very weak child who was not expected to live. Thus, he was immediately baptized Michael and warped in his white baptismal clothes with his baptismal icon in anticipation of his death. But, the baby Michael survived, the first miracle of his life. His family lived in severe hardship and at times without food. From his early childhood, Michael was associated with prayer and the church. He grew up a sickly and weak child. In 1843, his father, desiring to become a deacon, moved the family to Tobolsk in Siberia. While his father was unsuccessful in become a deacon, the move stirred in Michael a strong desire to become a missionary to the Altai. Michael Andreevich Parvitsky entered the Tobolsk Theological Seminary. While attending the seminary, Michael developed a craving for solitude. In 1854, he graduated from the seminary. Although he had the opportunity to further his education at a theological academy, it was his attraction to emulate the missionary work of the missionaries to the American Aleuts by doing the same among the Altai. On February 22, 1855, and with the blessing of his parents, Michael joined the Altai Mission as a teacher and member of the missionary staff working under the founder of the mission, Archimandrite Macarius (Glukhareva). Thus, he began what became three and half decades of dedicated and difficult work educating the Altai natives. Michael Nevsky began first to learn the Altai language through the interpreter, Chevalkova. Chevalkova was surprised how quickly Michael learned the language. Soon, he began translating the sacred books into the Altai language and preaching the true faith. In 1857, Michael Nevsky became a novice before taking his monastic vows on March 16, 1861, taking the name Macarius. The following day he was ordained a deacon by Bishop Porphyry (Sokolovsky) of Tomsk and Yenisei. On March 19, Dn. Macarius was ordained a priest. As a priest, his missionary opportunities increased. From teaching, preaching. and preparing people for communion, Fr. Macarius could now baptize and teach the Sacraments of Christ. The area was very poor, lacked medical care, and was the home of many diseases. The people, of superstitious minds, looked to religion in practical terms and expressed willingness to be baptized, if they would be healed of their ailments. The young Fr. Macarius often acted as a doctor. While his knowledge was very simple, the Lord often performed miracles through him. At times Fr. Macarius, in the face of great danger, brought calm among fighting factions through his fearless preaching, after which the formerly angry Altais asked for his forgiveness. In addition to his activities among the people, Fr. Macarius continued his translation work. In 1864, he journeyed to St. Petersburg to use the church's printing capabilities to print his liturgical translations in the Altaic language. Living at the St. Petersburg Academy, he spent two years correction proofs and obtaining the approval of the church censors. During 1868-1869, Macarius lived in Kazan, worked on the grammar of the Altai language, and publishing a number of divine service books in this language. While in Kazan, he observed the organization and operation of the schools for the baptized Tatars and decided to initiate such schools among the Altai. On July 29, 1871, Fr. Macarius was elevated to the rank of abbot, and in 1875 he was named assistant chief of the Altai Mission. In 1880, the head of the Altai Mission, Archim. Vladimir (Petrov) was consecrated Bishop of Biysk, and Fr, Macarius was appointed his successor as head of the Altai Mission, During the winter of 1881, Fr. survived a severe form of typhoid fever. In 1883, Fr, Macarius was raised to the dignity of archimandrite. On February 12, 1884, Archim. Macarius was consecrated Bishop of Biysk and vicar of the Tomsk eparchy. With the rise of revolutionist activity, Bp. Macarius denounced their activities and corrupting influence on people. His outspoken denunciations brought retaliation. On the night of May 22, 1886, his residence was set a fire with a clear intention to kill him. On May 26, 1891, Macarius was named Bishop of Tomsk and Semipalatinsk. Even with the duties of managing such a vast diocese, Bp. Macarius continued his missionary activities. On October 27, 1895, Bp. Macarius was made an honorary member of the Kazan Theological Academy. On May 6, 1903, he was awarded a diamond cross for his klobuk. In 1905, his title became Bishop of Tomsk and Barnaul as the eparchy was re-titled, and on May 6, 1906, he was elevated to archbishop. In 1908, his title was changed to Archbishop of Tomsk and Altai. On November 25,1912, Abp. 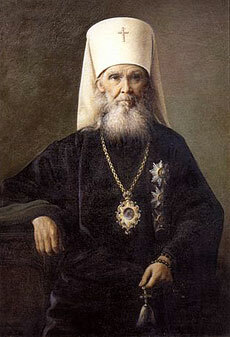 Macarius was named through an imperial rescript of Tsar Nicholas II as Metropolitan of Moscow and Kolomna, noting his long and dedicated educational and missionary ministry of fifty year in the Diocese of Tomsk. With his new position, Metr. Macarius also became a member of the Holy Governing Synod. A missionary in experience and spirit, Metr. Makarios, immediately upon arriving in the diocese, began to set a personal example. People in large numbers gathered in churches where he served the Lord. After suffering for some six years of a debilitating skin disease, Metr. Macarius found he was miraculously cured when he was invited to serve a liturgy at the tomb of the hallowed St. John of Kronstadt at the Ivanono Monastery on December 29, 1913. He found that after the service in which he asked for healing, he began to be released that day from the painful affliction. In 1913, Macarius became an honorable member of the St. Petersburg Theological Academy. After the abdication of Tsar Nicholas on March 15, 1917, control of the government fell to the Provisional Government, in which Vladimir Lvov was named the Ober-Procurator. One of Lvov's first actions on March 17 was to dismiss, unlawfully, the sitting members, except one, of the Apostolic Governing Synod. As one of the "conservatives" and "Monarchists", Metr. Macarius was a prime candidate for Lvov's action, who rationalized his action on Metr. Macarius' through alleged associations with Rasputin. On March 20, 1917, he was retired by the Synod, together with Metr. Pitirim, Abp. Barnabas of Tobolsk and Abp. Ambrose of Sarapul. After his retirement Metr. Macarius was sent to Nicholas Ugresh Monastery where he remained for eight years in a "prison" as he himself called it. He was deprived of the ability to preach the gospel of Christ. After the Bolshevik revolution, Metr. Macarius was harassed by searches and confrontations with armed agitators looking for valuables. Metr. Macarius never reconciled with his forced and uncanonical retirement. In a letter of August 19, 1920, Patr. Tikhon stated, "the Holy Synod, in consideration of your 50 years of work in the Altai, offer that you keep for life the title of Metropolitan of the Altai." During August 1920, Metr. Macarius suffered a partial paralysis that remain with him for the rest of his life. During the last years of his life, Metr. Macarius was visited by a number of the faithful, who during those hard times wanted to, as one commented, "visit a living Russian saint". In February 1926, Metr. Macarius developed pneumonia. A few days before his death, he stopped eating and talking. On March 2, after the Sacrament of Holy Unction, the Apostle of the Altai fell asleep in the Lord. At his funeral on March 5, 1926, his funeral liturgy and burial was concelebrated by Abp. Innocent with six bishops and seventy-nine priests. Metr. Macarius was buried in the wall, near the altar, of the local church in the village Kotelniki, where he had lived since 1925 after the closure of Nicholas Ugresh monastery. In April 1957, Patriarch Alexei I established a commission, which uncovered Macarius' tomb. The coffin was almost in totals ruin (there was only the bottom board). However, his body and clothing were uncorrupted. Later his relics were transferred to Holy Trinity-St. Sergius Lavra and placed under the Dormition Cathedral of the Lavra. In 2000, the Synod of Bishops of the Church of Russia, glorified Metropolitan Macarius. This page was last edited on October 25, 2012, at 14:10.